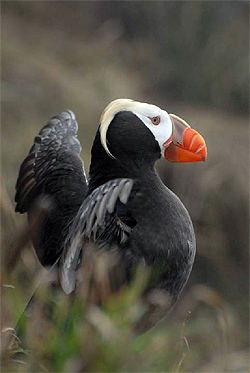 The Tufted Puffin is among 125 species of concern found in the Salish Sea. Photo: Peter Hodum. Species of concern are native species, sub-species or ecologically significant units that warrant special attention to ensure their conservation. The number of species of concern within the Salish Sea is used by the US Environmental Protection Agency and Environment Canada as a transboundary ecosystem indicator (called "Marine Species at Risk"). Within the Salish Sea, four jurisdictions assess which species require special efforts to ensure protection and survival of the population: the Province of British Columbia, the State of Washington, the Canadian Federal Government, and the United States Federal Government. As of December 1, 2015, there were 125 species at risk in the Salish Sea. Between 2002 (when the list was first compiled) and 2008, the number of listed species grew at an average annual rate of 1% from 60 to 64. It then made a precipitous jump to 113 listed species in 2011 (an average annual growth rate of 15% for 3 years) and has since continued to grow at an average annual rate of 2.6%. Some of the increase seen can be attributed to better understanding of the number of fish, reptile, bird and mammal species known to use the Salish Sea; however, most additions represent new listings due to concern about population declines. The number of species of concern provides a crude indicator of ecosystem health, permits cross checking of species of concern between jurisdictions, suggests where more research is needed to assess species status or causes of decline, and highlights where transboundary approaches could benefit species recovery. Assuming listing efforts have been consistent, the increasing number of species of concern within the Salish Sea over the last 13 years suggests ecosystem recovery efforts are being outpaced by ecosystem decay.